The new LEONARDO® Mini is the response to the high demand for a space-saving, economical, and at the same time versatile device, that also meets the high quality standards of biolitec. The just 900 grams light model is available in three different versions that meet all individual treatment requirements: LEONARDO® Mini Dual, LEONARDO® Mini 1470 nm and LEONARDO® Mini Athletic. 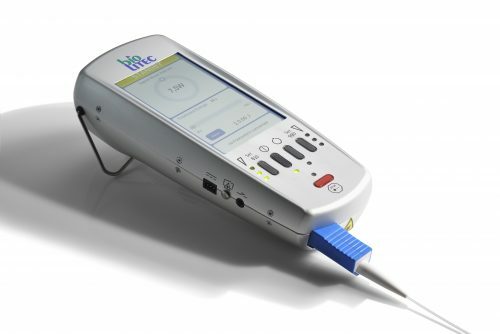 The latest in the LEONARDO® family of lasers from biolitec® is the handheld LEONARDO® Mini (1470) and Dual (1470/980). The dual wavelengths allow for effective cutting and vaporisation. This unique wavelength blend is patented by biolitec® and exclusive to Promed Ltd. in the UK. The biolitec® LEONARDO® Mini laser is designed to work in perfect combination with a broad spectrum of proprietary medical fibres and application kits developed by biolitec®.